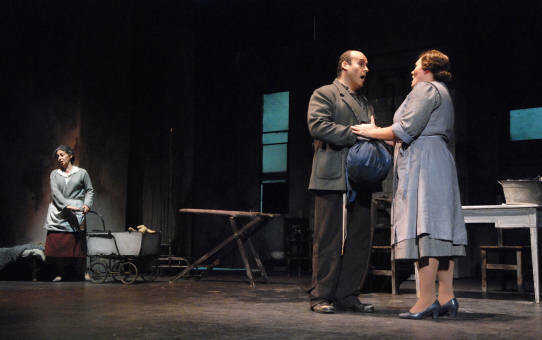 Buenos Aires Lírica’s production of The Consul is the year’s second offering of Menotti in Buenos Aires and as the composer’s first full length opera, was in a sense a nice counterpoint to the earlier offering of his first two shorter works. First performed in Argentina in 1953, just three years after its premiere, the first production in its original English was only in 1999 and has now been followed with this latest one. With its focus on life in a police state and the bureaucracies of gaining entry to a foreign country The Consul does not present a happy story, and to convey the depths of feeling it contains depends as much on the dramatic as on the sung aspects. For this, this production was particularly successful, with singers every bit as accomplished dramatically as musically. The tensions were palpable throughout – the sense of desperation of Hernán Iturralde on the run as John Sorel, of resign of Virginia Correa Dupuy as his mother, and the despair and strength of Carla Filipcic Holm as his wife. Elisabeth Canis was a particularly odious secretary and Leonardo Estévez was a wily secret police agent. Only with Osvaldo Peroni’s Nika Magadoff was there a sense of humour during the long waits in the consulate, and the other cameos were also well played – Mr Kofner by Walter Schwarz, the foreign woman by Andrea Nazarre, Anna Gómez by Gabriela Ceaglio, Vera Boronel by Vanina Guilledo, and Assan by Mariano Fernández Bustinza. The look and feel of the production was such that it could have been taking place at the time the work was written, more than half a century ago, or in some country today, and a nice touch was booths on both sides of the stage where the untold, behind the scenes, action of the terror state was played out. Noteworthy too was that the English diction was generally good, and the orchestra was well conducted by Javier Logioia Orbe.